Verity Smith is a blind international dressage rider, singer, songwriter and author. Due to a rare genetic disorder, Smith gradually lost her vision from the age of eight, becoming registered as officially blind by 16. She started riding horses at the age of 3 and competing on horseback since the age of 5, and at the age of 8, when doctors told Verity that she would go blind, she responded, “It’s ok, my horse can see for me!” Her courage and grace in the face of adversity has not relented since. Her life is one of continually defying convention and breaking down boundaries. She has represented Great Britain in the Paralympics, and is now training with the aim of qualifying for the 2020 Tokyo games to fulfill her dream of competing on the Able Bodied Team (Check out Verity’s GoFundMe Campaign to support her quest to make Olympic history). Please enjoy our interview with Verity Smith! Tell us about your introduction to Stoicism. Was it through The Obstacle Is The Way? How did you encounter it? Stoicism entered my life at a very young age without my even knowing what it was. I was a fledging Stoic with a fluffy down of circumstance. I think that we all come into this world natural Stoics, born with no material trappings, just basic needs with patience and acceptance imposed upon us in our moment of birth. However, focus and will soon kick in! It seems to me that it is the clutter of life that distorts and clouds the perception of the ‘newborn stoic’. It was brilliant that I went blind at the age of 8, before the clutter of my life got a look in. Unbeknown to me I still retained that inherent liberating Stoicism. In my innocence, although I did not know its name or its meaning, ‘Stoicism’ and humor accompanied me into my blindness, teaching me patience, acceptance, consideration, concession, and a stillness that extinguished the creeping destructive frustration that sometimes threatened to upturn my little boat. Ironically, it was not until many years later that I literally tripped over a book that had slid off my fully sighted and slightly frenetic sister’s bedside table. As I rubbed my bumped toe, she giggled as she informed me that the book’s title was The Obstacle is the Way. ‘Oh no,’ I said, ‘Not another self-help book!’ Apparently not, she was so passionate about its content that I became intrigued. Suddenly I was aware that the way I dealt with life had a name. Is there one Stoic passage or quote that has struck you the most? Any Stoic practices you’ve taken and applied to your daily routine? Einstein’s quote rings very true to me. I really believe that if we take the time to accept and adapt to our limitations, all be they physical or emotional, we find the way to circumnavigate the boundaries of those limitations and move outside them into the limitless. Being blind can be emotionally and physically isolating. You might say that one lives within the confines of oneself; my physical world could be defined as being only as wide as my arms can reach and there is no external visual distraction from an internal turmoil. But as soon as you, metaphorically, step outside of those confines, the world reaches as far as the breeze that brushes your face and can be as comforting as the soft grass beneath your feet. As Seneca said, “We suffer more in imagination than in reality.” It is the power of the mind to be unconquerable. The beauty of losing my sight as a child meant that my imagination was still so virile that my mind had not yet been molded and constrained by the conventions of growing up. It was free, which enabled me to explore a physical and emotional liberty of a different kind. Sometimes, even now as an adult, when things get tough, the tough turn into cartoon characters, which makes an external problem internally much more digestible as it gives me an immediate perspective! No news can be so bad when delivered by Roger Rabbit, and no person can be so mean when they have the face of Mr. Snuffleupagus from Sesame Street. Even when my sister is mean, she takes on the guise of Cruella de Vil and I thank my stars that I do not have a Dalmatian as a guide dog! When you cannot see, every step is a step into the unknown and you can either mentally brace for a fall or embrace an adventure. Being blind has taught me how to pause, to consider, to evaluate and to appreciate the moment, all be it good or bad! I don’t simply move through life as I am simply not able to. I have to absorb my surroundings, which in turn gives me the space for a mental pause to consider and appreciate where I am in the present. It affords me a mental focus. We live in a very reactive world, a very flippant disposable world that is saturated with visual stimuli. We are blinded by the overwhelming of the ‘visual’ in this day and age. We blink and click, meaning gone within the blink of an eye or the click of a mouse. We visually browse through life, overlooking its meaning. The great advantage of being blind is that I am literally blind to this desensitization allowing me to retain the stillness and focus that I developed as a child. It must be so hard to be buffeted and beaten by the two-dimensional image – the flash card that screams momentarily but influences exponentially. The Stoic practice that I inherently employ probably falls most in line with Seneca’s quote that “If a person doesn’t know to which port they sail, no wind is favorable.” Because I am internally focused, my goals have not been externally blurred by the candy store of options that our society and commercial world invites. I have always been able to concentrate solely on the gifts I have been given without allowing my determination and will to be distorted by options. My goals have remained concentrated not diluted by life. In essence, a Stoic practice that I think everyone would merit from employing is pausing, taking a breath, and assessing and considering the moment before reacting and responding to it. You starte to lose your sight at age eight. Do you remember what you felt at the time? How, at such a young age, did you have the strength to face such adversity with so much grace and courage? “When you go into the darkness take with you what you have learnt, for the darkness will always be there but you can light it and watch it burn. I was an explorer—exploring the world through my other senses, using what sight I had to help map my world in a different way. Like Alice in Wonderland, my world became ‘curiouser and curiouser.’ I felt that I was rich—I had six senses and was only going to lose one! I would always remember my Mum’s face as a beautiful 30 year old (Unfortunately my sister would always be 10 in my eyes!). I began to understand the power of my thoughts—how if the sky was grey I could color it in blue in my mind’s eye, how I could paint the beautiful horizon upon the canvas of the dullest of views. The world became multi-dimensional. As my eyes went to sleep my other senses awoke. I was determined and adaptable and believed everything was achievable. Quite literally, the obstacle was the way—if I could not get through, I Had to find my way around it using my other senses. I had to find a physical pathway, which in turn tailored my mind to think outside ‘The box,’ to assess situations and devise solutions. I discovered navigating the urban jungle of the man made environment far easier than the chaotic jungle of nature’s whim. There was a geometry to man’s architecture whereas nature just sprung up, in a beautiful tangle, just where and when she felt like it. But in her defense, even though I often tripped over a tree root, bumped into a misplaced oak whilst exercising my senses in the woods at the bottom of the garden, nature was kind enough to round her edges with an organic gentility that spared my bruising. In contrast, when bumped into, the sharp, angular rigidity of man’s concrete corners tattooed their coordinates on my memory. My parents were a huge influence on my ability to cope. They were adamant that, as they themselves were not blind, it was up to me to find my own limitations. They never told me to be careful, to not try to do things. In fact the only thing I can recall my mother ever telling me not to do was to become a brain surgeon! At school I was just the same as every other kid except my school bag contained an array of gizmos and gadgets, binoculars and magnifiers, bestowed upon me by the medical profession to help me in class. Perhaps it might have been natural for me to be shy and reticent to flaunt my wares amongst my class of 8-year-old peers, but I decided there must be some perks to gong blind. Unique surely could be chic. I set about renting out my binoculars for a small fee to those boys eager to watch the school rabbits, Fluffy and Topsy, bonking frantically in their hutch in the school quad, and my magnifiers proved a hit with the budding botanist of our class, much to the dismay of our school’s insect population. Although I made a tidy profit from my entrepreneurial efforts, the most important lesson I took home with me from those school days was the power of ‘Perception’—quite literally in my case, how one looks at something with a positive or negative attitude can change the perception of others. Throughout my sight loss, horses were my private sanctuary, my relief. I fell in love with these majestic animals when I was aged 3, long before my blindness got a look in and as the world faded from my eyes, my love of horses galvanized in my heart. They were the magical creatures that allowed me to ride the storm of my blindness. Galloping across the fields on my pony, I was free, I could stride out without consequence, with abandon, When I rode my feet didn’t touch the ground, it was like flying, I became a little centaur in love with the freedom of mind and body that horses gave me. I remember that when the doctors told me that I would never drive a car, I simply answered, “That’s ok, my horse can see for me.” On reflection, I think that horses were a kind of natural therapy for me. They allowed me to empty myself of worries, almost like a meditation, yet at the same time they invigorated and re-energized me equipping me to face the next challenge. Epictetus, walked with a limp due to his time chained up as a slave, said, “Lameness is an impediment to the leg, but not to the will.” You are a leading ambassador for the promotion of “disability capacity.” Can you elaborate on what that means to you? What do you tell someone struggling with a disability or an injury that changes their life? Epictetus made a very good point when he said that lameness was an impediment of the leg not of the will. To my mind, I often feel that people are more disabled by their thoughts, state of mind, perception, than they are by anything physical. The most physically disabled person can often be the most capable and the most physically able the most incapable. It all comes down to ‘strength of will’. I was blown away by the impact of what a positive attitude of mind can facilitate when I was 15 years old. Due to my eyesight’s continued deterioration, I was sent to a boarding school for the blind and physically handicapped. I was truly unsure as to what strange world I would be stepping into as I was the only ‘disabled person’ I had ever met. It was an inspirational eye-opener! The school was a place void of pity and full of energy. The issue of disability in all its forms was neutralized by its ever-effervescent presence. We were all missing something—sight, legs, an arm or two, or sometimes, all of the above, but together we made a whole. Everyone was lacking something that someone else had so we jig-sawed our talents together to make the complete picture. If we focused our will and worked together as a team, we could achieve pretty much anything. The sum of our parts made a great whole and everyone had a part to play no matter what parts they were missing. I learned so much about humor, life, music and sport during my time at the school. I had always loved music but had been unable to sight read and so had shrunk from the cello, and subsequently the piano, as a result of grumpy, frustrated music teachers. I had retreated to the solace of my own singing voice, believing my voice to be the only instrument that nobody else could dictate how to play. At this school, music was a celebration where everyone banged, plucked, and bowed what ever they could with whatever they had, to create a cacophony of life. It taught me the perfection of imperfection and the beauty and honesty of one broken note. This was an invaluable lesson that I carried forward with me into my music career as a singer/songwriter. Sports Day at our school was a life lesson unto itself. It was a hoot that pushed everyone to their physical limits no matter what their physical limitations were and in ways that made the mind boggle. The three-legged race really did take on a whole new meaning! I was very fortunate that I lost my sight gradually over a few years. This enabled me to adjust mentally to my situation with the same genteelness. It also gave those around me time to learn the ropes, as it was unchartered territory for us all. Each individual and every disability is so different. It must be so hard to have a life-changing disability that comes on suddenly and abruptly changes everything in the immediate. It is also very different if, as an adult, you are suddenly faced with such a trauma because as adults we have established our way of being. Physically and emotionally, we are less malleable than children. But when the mind and body are in shock, there must be nothing worse than someone telling you ‘chin up and get on with it’—honestly I think I would probably throw a punch. The mind needs time to absorb shock and the patience to travel through a dark period of acceptance. People need to give themselves space to be kind to themselves. I am always amazed and humbled by the natural resilience of the individual. Like grass pushing up through concrete pavement, people’s ability to adapt and push through the cracks is phenomenal. One needs to allow time to evaluate and adapt but the thing that has carried me through is retaining a sense of perspective, patience, and humor. However, just because I am blind does not make me qualified to tell other people how to cope. All I can say is that life goes on and actually, you may find it richer than you anticipated. I never set out to be an ambassador for the Ability in Disability. I simply tried to be the best at the things I could do. I like to defy convention but this has always been more about challenging myself than setting ‘an example’. Some people call me a campaigner, but in actual fact, I simply try to iron out the road bumps that I, as a blind person, have tripped over on my journey through life. I think that if I can change something to smooth the path for the person behind me then that can only be a good thing. Yes, I got guide dogs on planes, Braille on tampax machines in airports (after an embarrassing purchase of a blackcurrant condom) and managed to change the Paralympics blindfold rule, but these were simply obstacles that presented themselves on my journey. They needed to be changed in order to facilitate mine and others lives. I think that being labeled an ambassador is far too grand a title. I’m just a girl who hates injustice and won’t accept some of societies unthought-of quirks that have an impact on people’s lives. When I give speeches, I talk mostly of my life experiences and the humorous situations that have enlightened me. I talk very little about disability, as it is peoples’ ability that fascinates and engages me. The Stoics loved to use sports as a metaphor (particularly wrestling but also chariot racing). You are currently working towards becoming the first disabled dressage rider to compete in both the Paralympic and Olympic Games. What is it that you love about athletics? Is it the mastery? The competition? Challenging yourself? I love all three: the challenge, the mastery, and the competition. Sport is a medium through which we can push ourselves both physically and mentally. School taught me so much about the physical strain and mental strength required to achieve excellence in sports. I was made head of sports for my house within two weeks of being at the school. I fear this may have been more to do with my simple ability to move as opposed to my talent as a sportswoman—I had all my arms and legs! As a child I had always competed in the equestrian sport of show jumping but there were no horses in sight on the school campus so I was a little out of my depth. Before joining the school I had decided to give up competing in the show jumping arena deeming it too dangerous for myself and my horse. As my vision got lower and the jumps got higher the risk got greater and although I was determined I was also realistic. Horses were still my freedom and would always be and I had been quite frustrated at the necessity of this decision but I was not sure where to turn or how to continue in equestrian sport. School reignited my desire to compete, as I was astounded and inspired by the sporting excellence achieved, against the odds, by my fellow students. It brought out my competitive streak and made me realize that I wanted to be the best I could be. I just needed to find the equestrian discipline in which to excel. I needed a goal and a focus. Our school jumble sale of bodies and mismatched anatomies sparked me on to have a go at beating the odds. I set to work trying to find an equestrian discipline that I could compete in on equal terms with all comers. This is how I discovered dressage. I had always thought that dressage was for old ladies with expensive horses who had lost their nerve. Basically, I thought, as the term implies it was ‘flat work’. I had no idea that it was the ballet of equestrian sports that would require years of training and skill to become even mildly ok at it—let alone good. The beauty of dressage is that it is set on a 60 by 20 metre arena—the size and shape of which never changes. It is a stage upon which horse and rider dance, pirouette, passage and piaf the most beautiful of dance routines between fixed points. The judges placed around the outside of the arena then mark the couple for elegance, accuracy and movement. ‘Hallelujah,’ I thought, ‘I’ve found my sport.’ Years later I am still trying to refine it! I learned that if I counted my strides, if I rode every movement with feeling, I could stand up against all comers. It was down to me to go as far as my natural talent would take me—be that a short or a long way. I had the possibility to develop my ability without being disabled by my blindness. I have turned not being able to see into an advantage. Unlike other riders I cannot see to simply travel between the points of precision on a dressage arena while performing a figure. I have to feel and embrace, ride and digest, every single moment and stride. 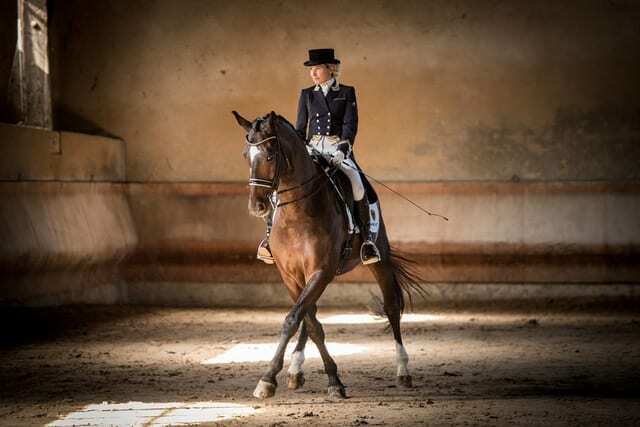 In the early years, after discovering dressage, I set my mind to focusing and training as hard as I could returning every weekend from boarding school to ride. At the age of 18 I was very proud to represent Great Britain in the Para Team at the World Championships in Denmark. Now I compete against able-bodied folk and am ranked 12th in France at able-bodied Elite level, as well as being selected for the French National Para Squad. I love to compete in able-bodied competitions, as there are no limitations imposed upon me. I am judged as everyone else is. The only concession given to me by the International Equestrian Federation is to have a human caller at each of the letter markers that border the arena. These callers shout the letter markers as I approach creating an audio as opposed to a visual reference. My Scoobies, as I call them, are made up of a hilarious group of non-horsey friends who shout the letters of my routine for the ten minutes we are on stage. It’s a bit like the Muppet show with alphabet Tourettes, but they are a lean, mean, calling machine, and together, we are a winning team. I absolutely love winning (who doesn’t! ), but my greatest motivation is achieving a better score than the competition before. With your lifelong love for horses, can you share any great lessons you’ve learned from horses that you think apply to life? The one thing with horses is that you cannot cut corners—you have to be thorough and patient. You can never win by strength. Horses are incredibly intelligent within a certain band. They are instinctive creatures that react to emotion. Around a horse, you must control your fears, be still yet assertive. They speak a different language but, if one has the will and perception to observe, communication is simple. A lesson that we can most certainly employ when communicating with people. Horses work in a herd dynamic. People are very similar—we are tribal. However, within the herd, each horse is respected and has its role. The herd functions as a whole where each individual is important, similar to team sports. In a very individualistic world we need to look at ourselves as an interactive, interdependent group. Horses have taught me consideration and respect and that goodwill is freely given if asked for with non-confrontational communication. I also find it so refreshing to spend time with these beautiful creatures as they remind me of the importance of nature and the simplicity of things. Marcus Aurelius talks a little bit about horseback riding in Meditations—mostly about how he notices that he’s better at using the reigns with one hand than the other (because he practices more that way). Curious how you continue to challenge and improve yourself in a sport you’ve done for so long? I have been riding dressage all of my life and still feel that I have so much to learn. Everyday poses a new challenge and I have over the years adapted and revised my methods of training. Every horse is different, like a dance partner we all have physical strengths and weaknesses and as sentient creatures horses also have their own personalities that require a different approach. I never think of myself as good at my sport. I simply think that I can get better at it. It is a passion for me, an endless narrative that develops and morphs with the years and with experience. Like every sport, there is a lot of training that is repetitive but it is the tiny moments when all of that repetition and hard work comes together in harmony to create a second of complete symbiotic beauty between myself and my horse which makes it all worthwhile. It is the fix that we all crave. However 99% of the time, its just hard work, sweat, and sometimes, tears. Although, like everyone, I love to win, I am always competing against myself. If I win first prize but my scores are lower than in a previous competition, I always come away feeling, ‘right, next time I must beat that score’. We are curious what other “quake” books you might recommend to our readers? What have been the books that have most impacted your life? This book reinforces my belief that sometimes we are so busy looking for the next best thing that we are blind to the beauty and values that were there all along. I love the fact that in the book we travel full circle, gathering wisdom and experience as we go, only to return to ourselves. This was my favorite book as a child that as I went blind, enveloped me with the magic of believing. It is a simple book about a much loved toy rabbit that one day when threadbare and old, is discarded into the garden by the little boy’s nanny. Whereupon the years of love that the little boy had bestowed upon the rabbit allowed him to believe that he could be real—and he was. It is a simple story that made me believe in the strength of will and perception that anything was possible. I adored this book as the beauty of the writing created such vivid visual depictions of the smallest corners and inglenooks of the places where the story was set. This gave me a close up look of the minutia that I could now never visually see. I feel that this book offers a life lesson in the gift of giving as each character in their own way gives of themselves.